Looking for a good book to get lost in this Memorial Day weekend? The Barefoot Spirit is an entertaining rags-to-riches story of American entrepreneurship. Released this week, the paperback has already climbed to the top of the Amazon bestsellers list. Barefoot is famous for having rejected winemaking snobbery. Their colorful, plain-English labels marketed wine more like beer—a fun, not stuffy, beverage—with the slogan “get Barefoot and have a great time!” And by leaving the vintage and appellation, or grape harvest year and region, off their labels, the producer was free to blend a taste that was consistent year to year. Harvey says, “You shouldn’t need a degree in enology or have to be fluent in French to enjoy a glass of wine.” By the time they sold to Gallo, enough shoppers considered Barefoot their “personal house wine” that the company had grown to 40 employees and was selling half a million cases a year. But the intervening years were not a walk on the beach. Despite having done their homework to develop a product and package that was sure to appeal to their target market—the 37-year-old mom who picked up a magnum along with other kitchen staples at the grocery store—Houlihan and Harvey came up against some big obstacles getting it to them. Those included male industry gatekeepers who didn’t like the foot on the label; stores that complained their price was too high, but accused them of selling cheap wine when they dropped it; and small buyers who wouldn’t stock “unestablished wines,” but later turned them down for being too big. Other frustrations with regulations, licensing, and finances will be familiar to any small business owner. Among the most aggravating: “Our employees could qualify for a mortgage because they had good jobs working for us, but the same banks would tell us, you can’t qualify for a loan because you’re self-employed,” Harvey says. It took a decade of hard work to make Barefoot profitable. Today Houlihan and Harvey, who have been engaged for 28 years, live in Sonoma County, two miles from the rented farmhouse where they started the business in the laundry room. They say there was enough room for a home office there because they couldn’t afford a washer and dryer at the time. See more in the Yahoo! 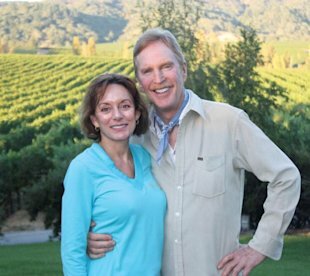 Small Business Q& A with Barefoot Wine founders Michael Houlihan and Bonnie Harvey.